It does one thing perfectly. I love food, so obviously I love Thanksgiving. Throughout my life, I've spent Thanksgiving every which way possible, joining friends' Thanksgiving dinners, trying potluck-style Thanksgiving meals, and even going out to restaurants. Some of my funnest Thanksgiving dinners, though, have been ones I've cooked and hosted in my own home. I know just how stressful cooking an entire Thanksgiving meal on your own can be, so I was excited when I heard about HelloFresh's new Thanksgiving box, which claims you can cook an entire seven-course feast in four hours. The second HUGE perk of the HelloFresh Thanksgiving box is that it saves you the ginormous headache of organizing, shopping for, and carrying all your Thanksgiving groceries home. 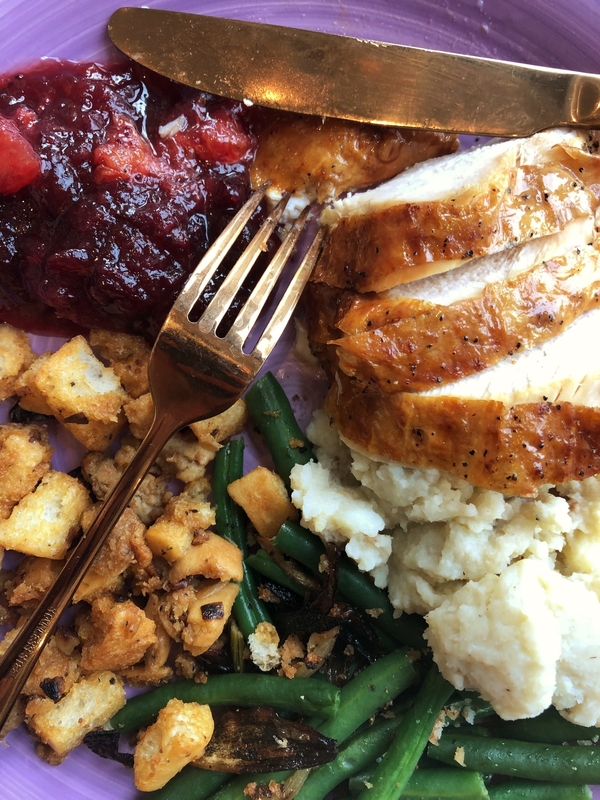 Every Thanksgiving Box includes all the ingredients you need to make a whole turkey AND six side dishes, including mashed potatoes, stuffing, green beans and shallots, cranberry sauce, gravy, and an apple ginger crisp. The kit also comes with a step-by-step guide on what order to cook everything in, which also saves you a lot of planning work and lets you focus on the cooking part itself. 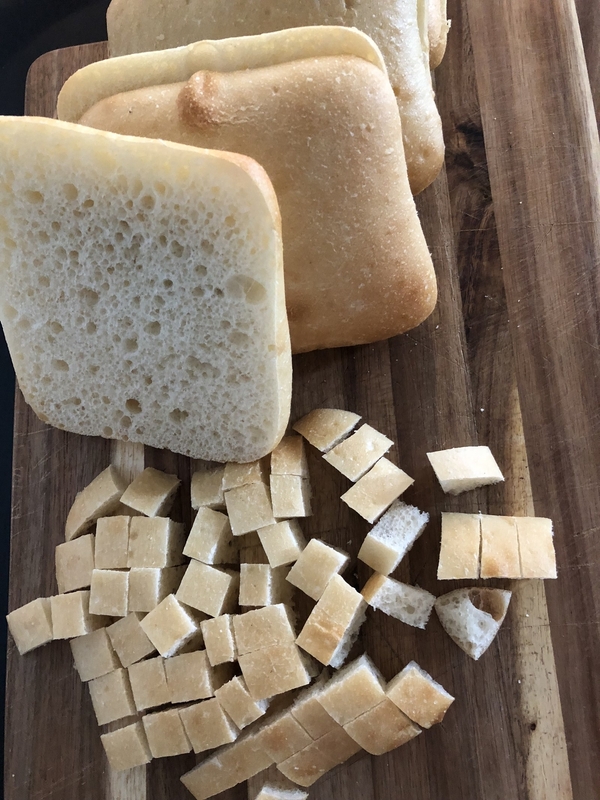 Of course, none of this convenience matters if the recipes don't taste good, or if the recipes are overly difficult and NOT time-saving, which is why I had to test 'em out. 1. 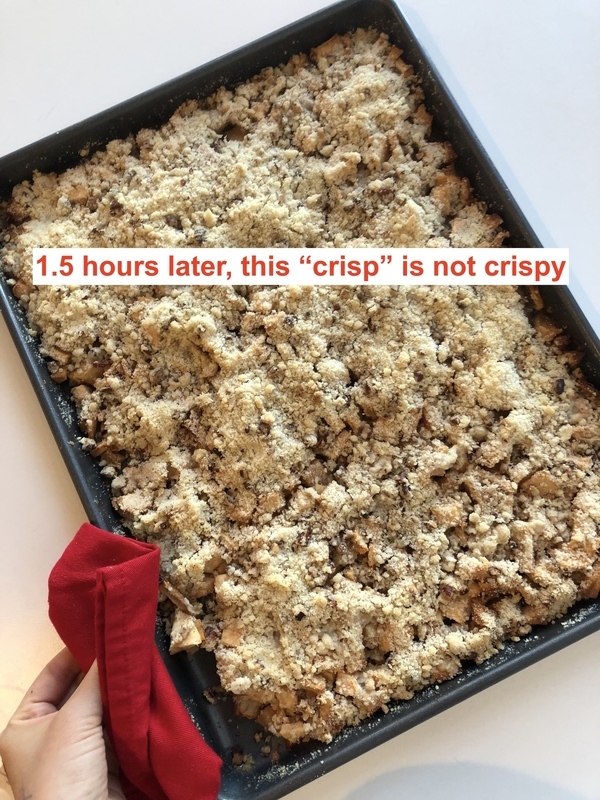 As per the guideline, I started with the apple ginger crisp, which, no matter how much I tried, did not actually crisp or brown. My mom once told me that (according to an old-fashioned Korean tradition), a lady isn't ready for marriage until she can perfectly peel an apple. I'd like to update that saying: If you can peel, core, and cut eight apples without losing your damn mind, you can literally do anything you want in life. Even if this dessert came out perfectly though, I would have definitely bought a separate pie. Because how am I supposed to kick-start my food coma without a buttery, flaky pie? 2. The cranberry sauce was the most cranberry gourmet sauce I ever had and, unlike the crisp, was totally worth the effort. 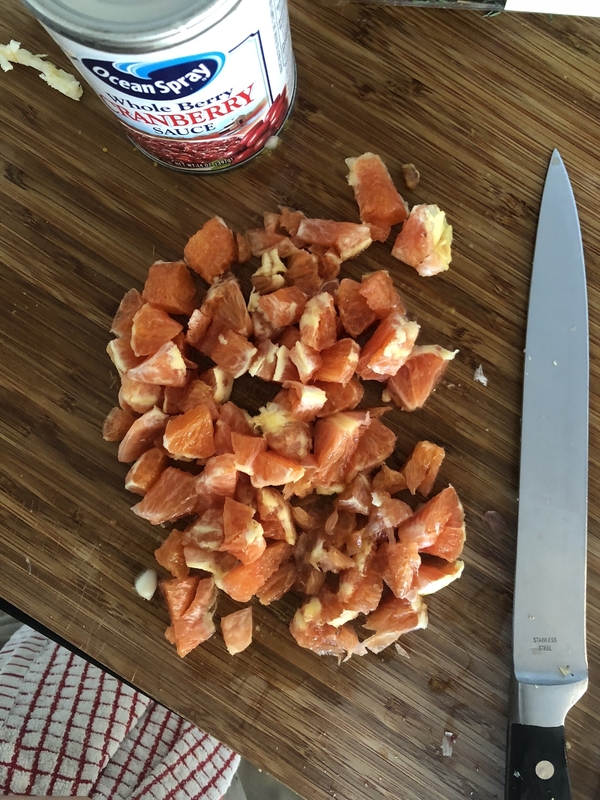 The recipe, which calls for orange zest, chopped orange, minced ginger, and cinnamon, sounds like a bougie cocktail you get at an annoying Portland bar. So I knew it was going to be good. 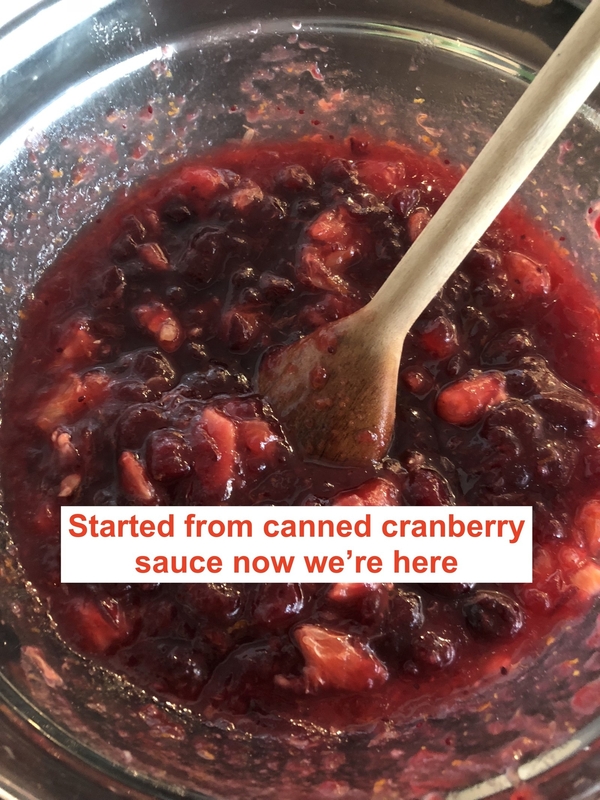 I know a lot of people are torn between serving canned cranberry sauce straight from the can and using a recipe, but I can say this one's totally worth the time, even if it does take longer than the claimed 10 minutes to put together. It's juicy, sweet, and just perfectly spiced. Also, the little bits of fruit serve as a nice palette cleanser between the many bites of dark meat and stuffing you'll surely be having. 3. Next up were the mashed potatoes, which tasted pretty classic, even without any butter. 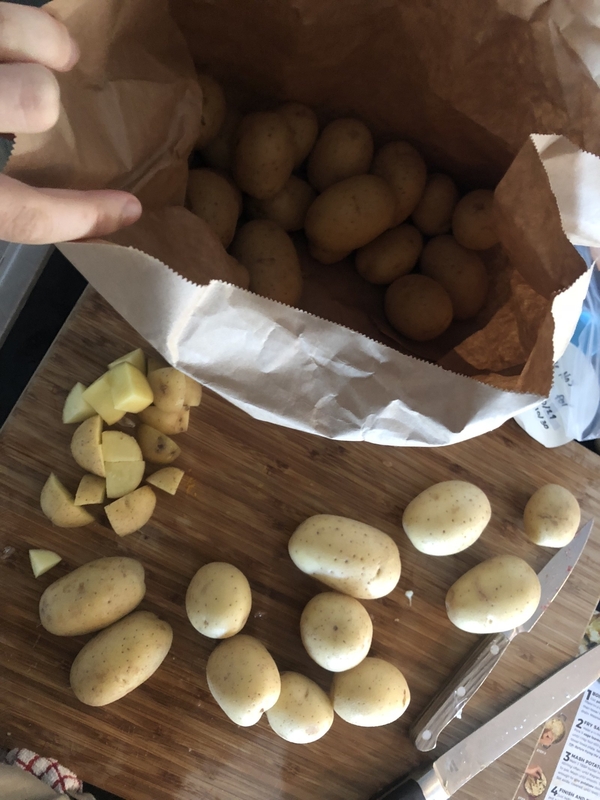 After wasting so much time peeling all those damn apples, my hands were pretty tired so I left the skin on these potatoes. I'm sure they would have turned out creamier had I actually peeled 'em, but whatever, BITE ME, AUNT CHERYL!!! This recipe doesn't call for butter, but I think adding a few knobs of butter would've made it even smoother and richer in flavor. 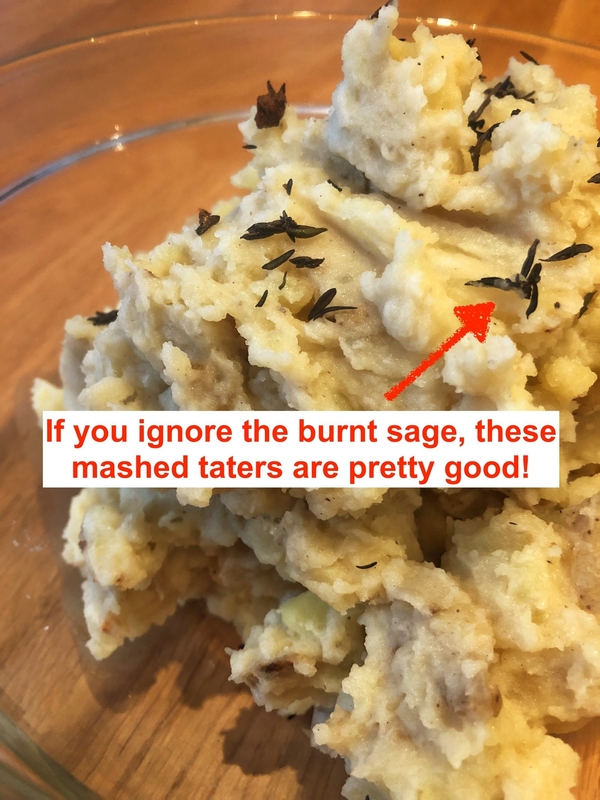 Also, please note the burnt sage on top of my mashed potatoes as a reminder to not look away (read: respond to the meme your friend just texted you) when frying herbs. They will burn. 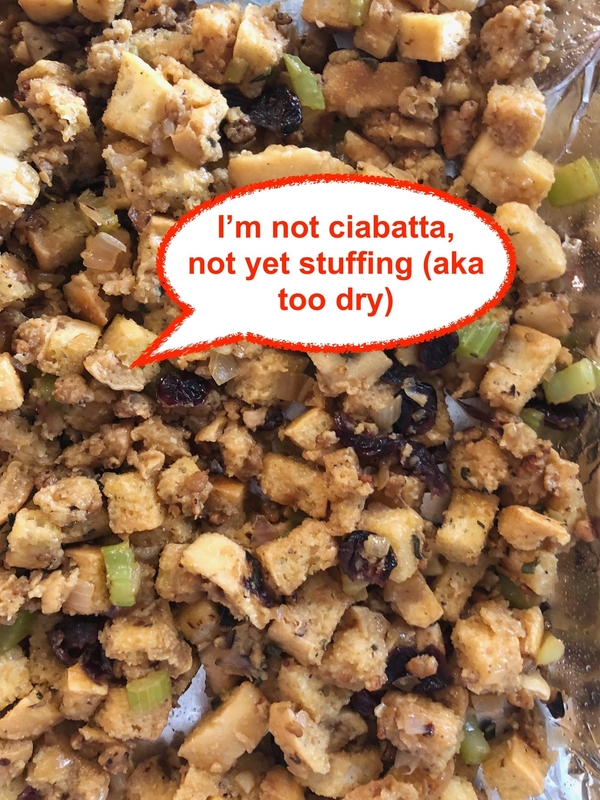 Everyone knows the stuffing is the true star of Thanksgiving side dishes, so I had high standards for this. And WOMP the stuffing turned out a little more like soft croutons than actual moist and fluffy stuffing. 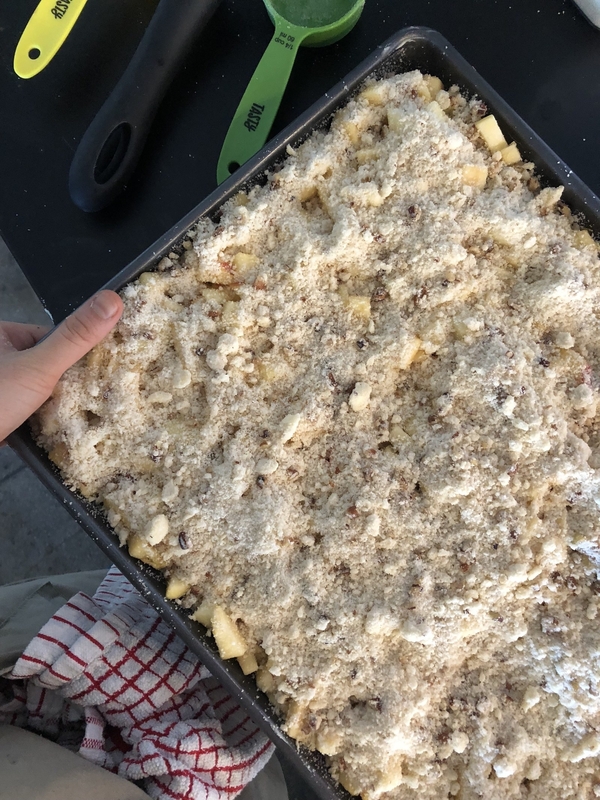 It's frustrating because the stuffing mixture looked wet and perfectly clumpy when I popped it in the oven. If I could make this again, I'd try adding a bit of extra chicken broth to make it a little moister in the bottom. 5. The green beans were annoying to make, but the caramelized shallots made them worth it. I'll be honest: Green beans are mostly a decorative touch on my Thanksgiving table. But not in this case. Blanching the beans was pretty annoying (as is anything that requires waiting for water to boil) but they paired perfectly with sweet, caramelized shallots and a nice, buttery dusting of a panko and almond mixture. The final result was a side dish that was healthyish and still pretty in line with Thanksgiving's butter- and sugar-heavy flavor profile. 🙃 Between the blanching, frying, and caramelizing, the dish def took longer than 45 minutes to put together, but it was worth it. 6. 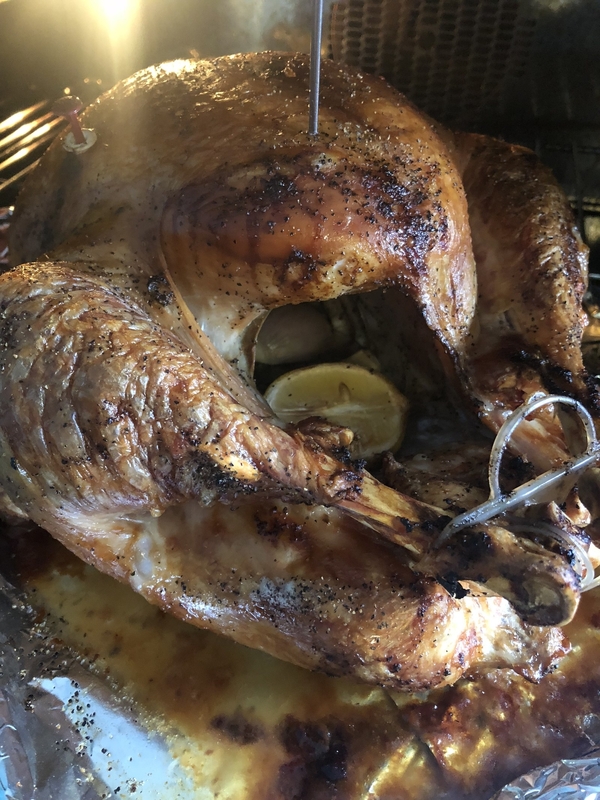 The star of the whole Thanksgiving box was the turkey — which was easy to make, juicy, and actually cooked completely and perfectly in 1 hour and 45 minutes (exactly how long HelloFresh told me to cook it for!). WHEW. You've heard the horror stories about burnt turkeys, frozen turkeys, and supermarkets that run out of turkeys the day before Thanksgiving. 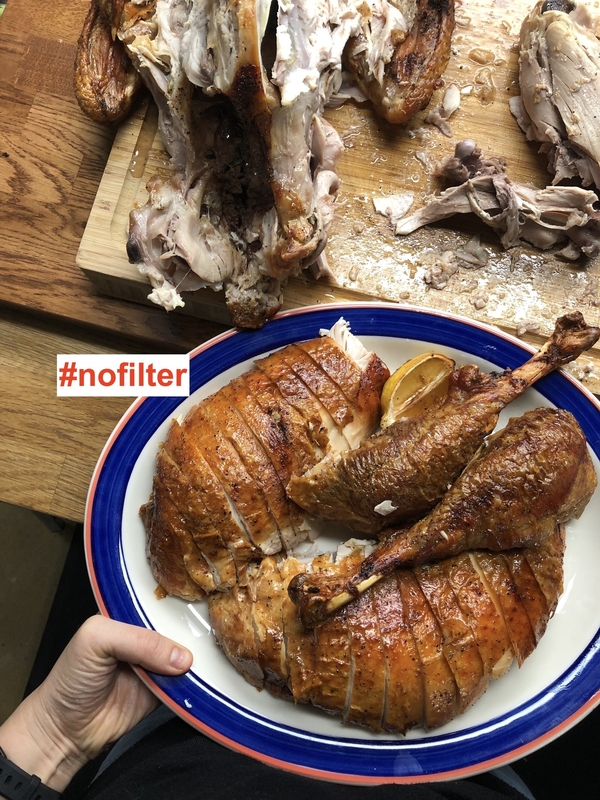 Well, if you get a HelloFresh turkey, and follow the directions to a tee, you'll get a perfectly succulent, crispy bird that's ready to wow all your in-laws. 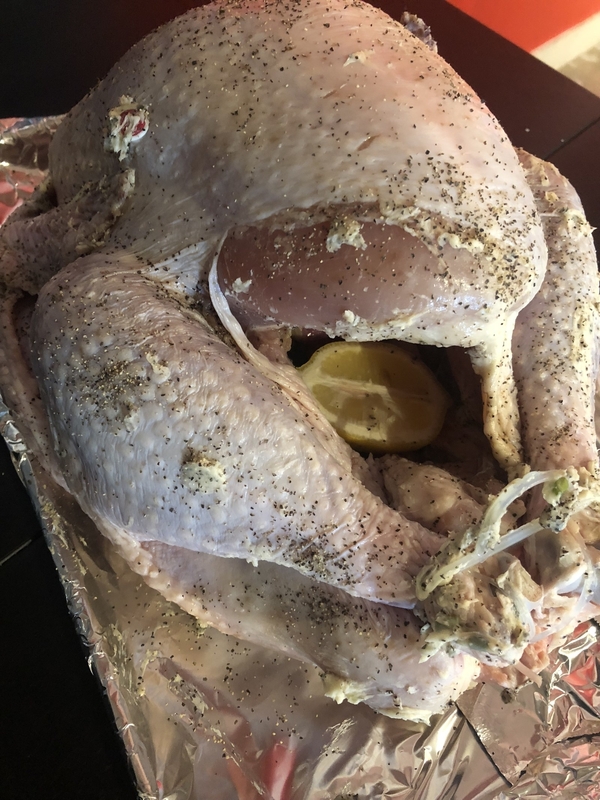 Once I opened the oven and saw how perfectly this turkey had crisped, I wanted to walk around the entire neighborhood showing it off like a flashy new engagement ring. It was honestly that beautiful. And how did it taste? It was succulent, fragrant, and fatty in all the right places. ;) I might not know how to peel an apple, but I can now safely say I know how to roast a perfect Thanksgiving turkey. 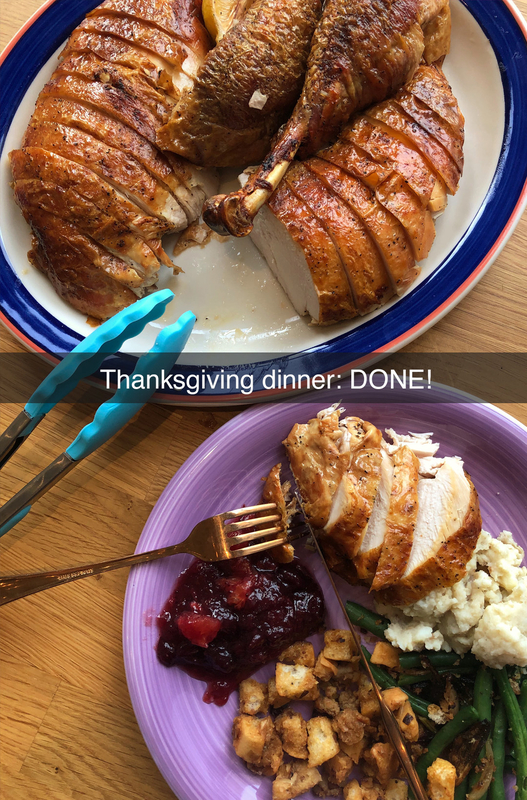 TL;DR: If you have the money for it, the HelloFresh Thanksgiving box is a pretty solid way to save a lot of time (though it WILL take longer than the claimed four hours to make) AND put together a slightly gourmet Thanksgiving dinner. Order the HelloFresh Thanksgiving box with turkey, sides, and dessert here for $158.99, or the sides and dessert box for $98.99. Just remember to order before Saturday, November 10, which is the last day you can reserve a Thanksgiving box.